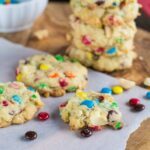 Cute little chewy cookies loaded with mini M&M’s, shredded coconut, and macadamia nuts will have you reaching your hand in the cookie jar again and again. The addition of coconut and macadamia nuts in these cookies makes them a little different and a little tropical. And with temperatures expected to reach 80 degrees in South Carolina, it’s going to feel a little tropical tomorrow. My daughter and I like to go to Goodwill together and hunt for treasures. I always make a bee line to the book section to look for cookbooks. Either I don’t find any at all that I would want, (It’s amazing how quickly dated many cookbooks get. Microwave cookbooks from the 80s? No thank you.) or I find a whole arm full. Never anything in between. One of my purchases on an occasion I came home with a whole arm full was a cute little M&M cookbook from the 90s called Brighter Baking with M&M’s Chocolate Mini Baking Bits. In this cookbook, they’ve inserted mini M&M’s into about every type of cookie and bar known to man. This recipe was the one that looked most interesting to me and it turned out to be one of my favorite cookies in recent memories. Mainly because I have become obsessed with coconut. This recipe makes a whole bunch of little cookies so be prepared to invite ALL the neighborhood kids over and be that scorned parent who gets everyone’s kids hopped up on sugar and then sends them home. 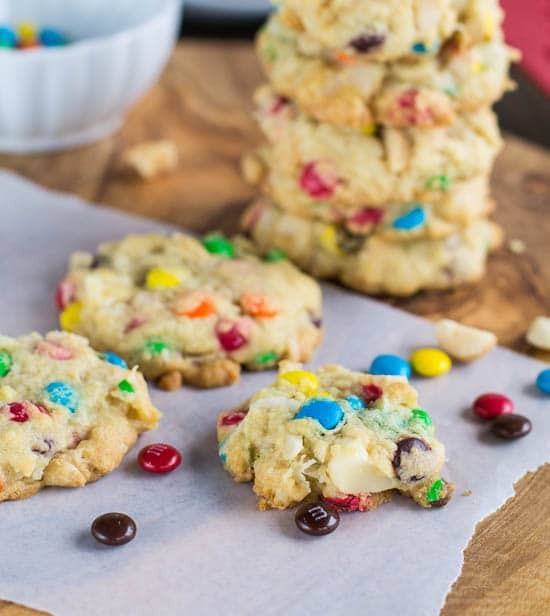 Chewy little cookies filled with mini M&M's, coconut, and macadamia nuts. Using an electric mixer, cream together butter and sugar. Beat in egg and vanilla. In a medium bowl, combine flour, baking soda, and salt. Add to butter mixture with mixer on low. Only beat until flour is mixed in. Add nuts and coconut and turn mixer back on low just long enough to mix in. Stir mini baking bits in by hand. Drop dough by heaping teaspoonfuls onto ungreased baking sheets. Flatted each mound of dough slightly with the back of a spoon. Bake 8 to 10 minutes, being careful not to overbake. They will still look underbaked when you remove them from the oven, but they will be perfect by the time they cool. Cool on sheets for 1 minute and then remove to wire racks to cool completely. Store in a tightly covered container. This entry was posted in Cookies, Desserts and tagged coconut, cookies, macadamia nuts. Bookmark the permalink. The coconut really gives the cookies an amazing texture. 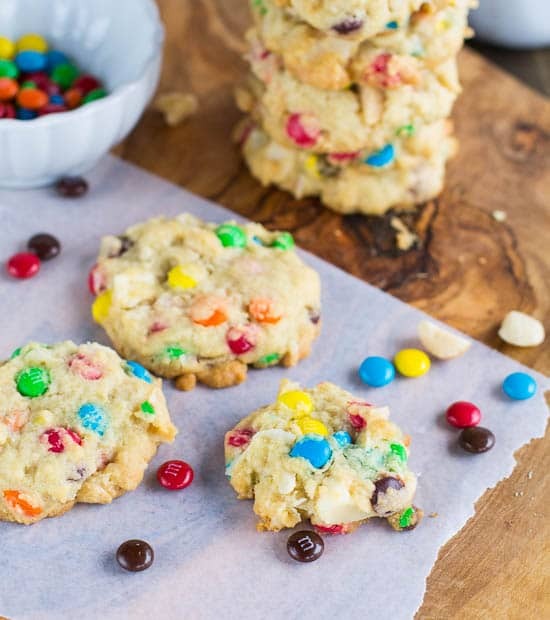 I love coconut flavors and m&m’s are one of my favorite ingredients to add to cookies, so these look pretty fantastic to me. Also, they’re adorable and pretty to boot! These look fabulous! I don’t know why but mini M&Ms make me smile. It’s a quirk. I love that you and your daughter go to Goodwill together! I love searching for cookbooks at Estate sales…I almost bought a microwave cookbook just for giggles sake! I love coconut in my cookies! What is it about M & M’s that is so alluring thru the years? So these spritely cookies would be quickly snatched off the plate—-there is no doubt. I always like coconut in cookies. It changes the texture a bit—that kind of chewiness that personally I like. Of course the nuts are very very classy. Adorable! 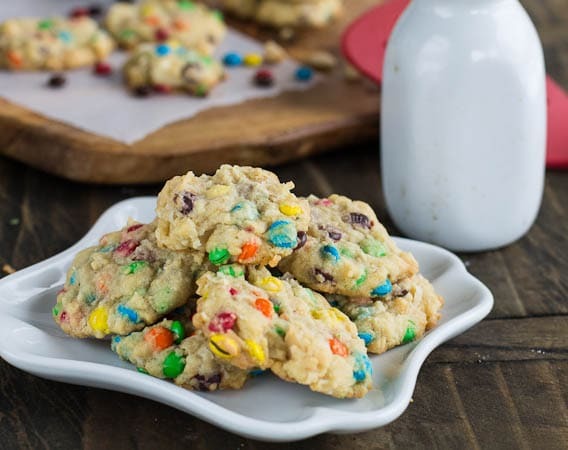 I remember the first time I had cookies made with M&M’s…I was surprised (for some reason) by how good it was! I love your cookbook hunts and this little cookbook you found sounds like such fun. Thank you Monica! Hunting for old cookbooks is one of my favorite things. Looking through them, it’s amazing how many foods have remained popular through the years and how many have fallen out of favor.